Skid steer loaders are king when it comes to the smaller jobs, be it landscaping a section, levelling a new house or shed site, or putting in a new driveway. Based in Thames, Scotty's Bobcat Services is now onto its second Cat skid steer loader. The first was a Cat 247B, replaced by an upgraded Cat 247B Series 2 machine. 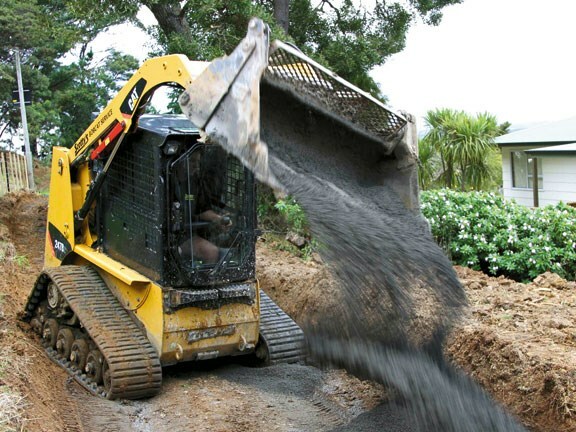 The company typically handles residential work in the greater Coromandel region. This means much of the work is completed in less than a day, so flexibility to get onto the site and complete the job quickly is of prime importance for the company. Sole operator Scott Manderson ordered his Caterpillar from the Hamilton branch of Goughs three years, and now 3041 operating hours ago. He likes the tracks his Cat offers. Scott feels that the vehicle is more stable, he can do more when he's on-site, and has found he's getting more work to do. He was limited with the types of jobs he could take on with just wheels for traction, but the tracks have opened up new avenues for him. 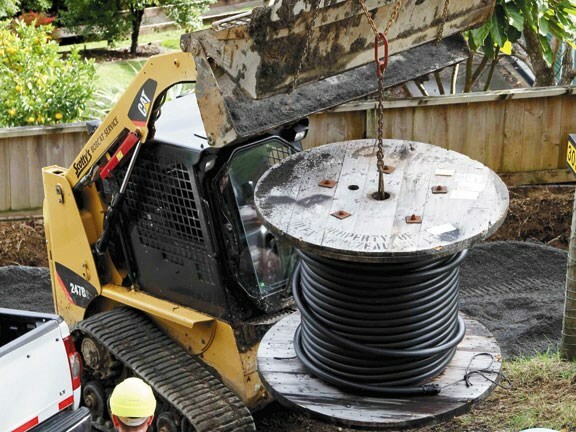 Important to Manderson was the ability to fit a tilt-hitch bucket system onto his new Cat, performed by Progressive Hydraulics Ltd in Hamilton. During my visit I could see the Katipo tilt-hitch's advantage: to refill a services ditch with "dust", Manderson simply tilted his multi-bucket, gave it an encouragement "jiggle", and most Gap 7 shingle fell into the right place. Manderson says he uses it every day: "When you're dealing with landscapers and they want to talk about getting a cross-fall across a driveway of 30mm - I just flick the button." Scotty's Bobcat Services now performs a variety of roles using the standard Cat 4 in 1 multi-bucket, the grapple bucket and the auger unit. The latter attachment takes about 30 minutes to change over, and the largest drill Manderson has is 600mm in diameter. However, changing buckets may take less than half a minute. Getting the most out of these small machines takes a lot of skill and experience. Manderson worked his 247B Series 2 really hard and neither the motor nor hydraulics failed to keep up with his speed. There was nothing wrong with the lifting power of the hydraulics either. Dual closed loop axial-piston hydraulic pumps are driven off the engine to service a pair of fixed displacement motors, which power the track final drive motors. 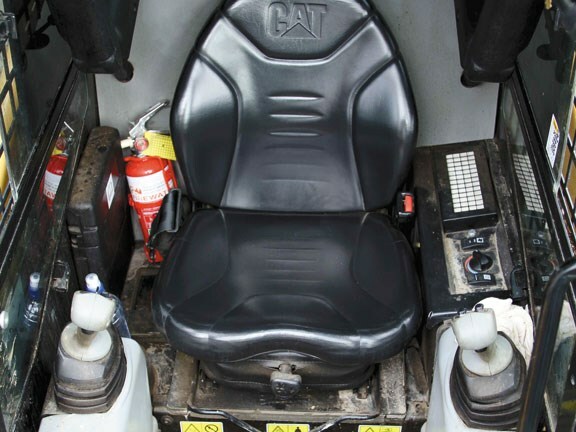 The high external visibility door to the small air conditioned cab has a safety lock-out function to prevent loader arm use, while a convex rear view mirror offers a wide view to the rear. To start the Cat 247B Series 2 the safety harness has to be lowered and the safety "Park" toggle switch depressed before turning the key. There are several buttons and a fuel gauge located at the top of the front pillars to operate the essential running gear, such as a hydraulic relief valve to change bucket hoses, engine pre-heat, and the lights. The left joystick has four buttons and a trigger. The top left button works the horn, while the two right buttons control the Katipo tilt bucket system. The fourth button and trigger are blanks, as is the right joystick trigger. The 4 in 1 multi-bucket crowd is operated by a thumb "roller" switch on the right lever, which Manderson says gives him good control when opening and closing the multi-bucket. 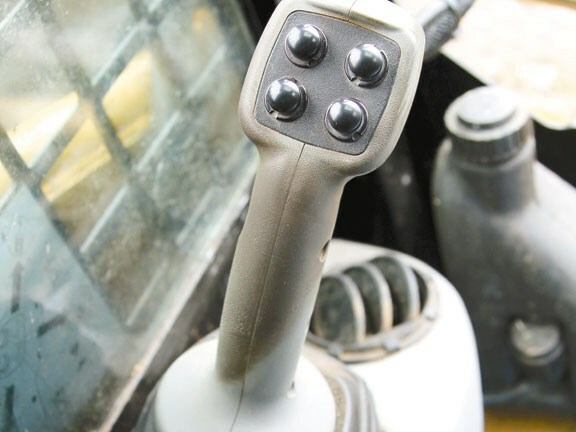 To speed up or slow down the operator can choose between the hand throttle in front of the lever or the foot pedal. Powering the 247B Series 2 is a four-cylinder liquid-cooled Caterpillar-branded Perkins 3024C T engine, rated to 45.5kW (61hp) at 3000rpm. The 2.2-litre Tier 2 powerplant is fed by individual injectors via a tiny turbocharger. With 24 wheeled contact points (both tracks), the 481mm (15") wide rubber tracks last Manderson around 1500 hours, compared to just 900 hours for the tyres on his old wheeled skid steer. Although he says replacement tracks are expensive, he calls it money well spent because he can do more work faster. Scotty replaces the tracks himself, saying it only takes around 45 minutes for both sides. The Caterpillar 247B Series 2 skid steer loader has the engine and hydraulic power to work fast and hard - and excellent lifting capacity to boot. In addition, the Cat's tracks mean it is more stable, with better traction compared to his old wheeled model. 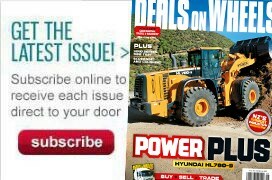 See a range of skid steer loaders for sale.